An F-type main-sequence star (F V) is a main-sequence, hydrogen-fusing compact star of spectral type F and luminosity class V. These stars have from 1.0 to 1.4 times the mass of the Sun and surface temperatures between 6,000 and 7,600 K.Tables VII and VIII. This temperature range gives the F-type stars a yellow-white hue. 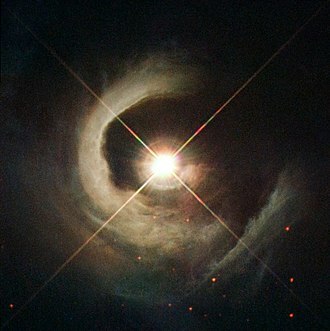 Because a main-sequence star is referred to as a dwarf star, this class of star may also be termed a yellow-white dwarf. Famous examples include Procyon A, Gamma Virginis A and B, and KIC 8462852. The revised Yerkes Atlas system (Johnson & Morgan 1953) listed a dense grid of F-type dwarf spectral standard stars; however, not all of these have survived to this day as standards. The anchor points of the MK spectral classification system among the F-type main-sequence dwarf stars, i.e. those standard stars that have remained unchanged over years and can be used to define the system, are considered to be 78 Ursae Majoris (F2 V) and pi3 Orionis (F6 V). 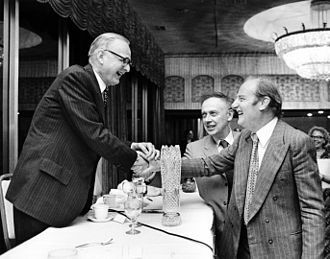 In addition to those two standards, Morgan & Keenan (1973) considered the following stars to be dagger standards: HR 1279 (F3 V), HD 27524 (F5 V), HD 27808 (F8 V), HD 27383 (F9 V), and Beta Virginis (F9 V). Other primary MK standard stars include HD 23585 (F0 V), HD 26015 (F3 V), and HD 27534 (F5 V). Note that two Hyades members with almost identical HD names (HD 27524 and HD 27534) are both considered strong F5 V standard stars, and indeed they share nearly identical colors and magnitudes. Gray & Garrison (1989) provide a modern table of dwarf standards for the hotter F-type stars. F1 and F7 dwarf standards stars are rarely listed, but have changed slightly over the years among expert classifiers. Often-used standard stars include 37 Ursae Majoris (F1 V) and Iota Piscium (F7 V). No F4 V standard stars have been published. Unfortunately F9 V defines the boundary between the hot stars classified by Morgan, and the cooler stars classified by Keenan, and there are discrepancies in the literature on which stars define the F/G dwarf boundary. Morgan & Keenan (1973) listed Beta Virginis and HD 27383 as F9 V standards, but Keenan & McNeil (1989) listed HD 10647 as their F9 V standard. Eta Cassiopeiae A should probably be avoided as a standard star because it was often considered F9 V in Keenan's publications, but G0 V in Morgan's publications. Some of the nearest F-type stars known to have planets include Upsilon Andromedae, Tau Boötis, HD 10647, HD 33564, HD 142, HD 60532 and KOI-3010. Some studies show that there is a possibility that life could also develop on planets that orbit a F-type star. It is estimated that the habitable zone of a relatively hot F0 star would extend from about 2.0 AU to 3.7 AU and between 1.1 and 2.2 AU for a relatively cool F8 star. However, relative to a G-type star the main problems for a hypothetical lifeform in this particular scenario would be the more intense light and the shorter stellar lifespan of the home star. F-type stars are known to emit much higher energy forms of light, such as UV radiation, which in the long term can have a profoundly negative effect on DNA molecules. Studies have shown that, for a hypothetical planet positioned at the same distance from an F-type star as the Earth is from the Sun, and with a similar atmosphere, life on its surface would receive about 2.5 to 7.1 times more damage from UV light compared to that on Earth. 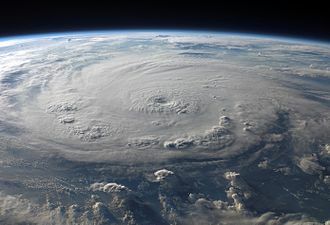 Thus, for its native lifeforms to survive, the hypothetical planet would need to have sufficient atmospheric shielding, such as an ozone layer in the upper atmosphere. Without a robust ozone layer, life could theoretically develop on the planet's surface, but it would most likely be confined to underwater or underground regions. ^ "New Insights into Debris Discs". Retrieved 23 May 2016. ^ SIMBAD, entries on Gamma Virginis A, Gamma Virginis B, accessed June 19, 2007. ^ a b The Perkins Catalog of Revised MK Types for the Cooler Stars, P.C. Keenan & R.C McNeil, "Astrophysical Journal Supplement Series" 71 (October 1989), pp. 245–266. ^ a b c d e f g Hadhazy, Adam (1 May 2014). "Could Alien Life Cope with a Hotter, Brighter Star?". space.com. Space.com. Retrieved 31 March 2018. The red-giant branch, sometimes called the first giant branch, is the portion of the giant branch before helium ignition. It is a stage of evolution that follows the main sequence for low- to intermediate-mass stars. Red-giant-branch stars have an inert helium core surrounded by a shell of hydrogen fusing via the CNO cycle and they are K- and M-class stars much larger and more luminous than main-sequence stars of the same temperature. The term red-giant branch came into use during the 1940s and 1950s, in 1968, the name asymptotic giant branch was used for a branch of stars somewhat more luminous than the bulk of red giants and more unstable, often large-amplitude variable stars such as Mira. Observations of a bifurcated giant branch had been years earlier. The red-giant branch was described as the first giant branch in 1967, to distinguish it from the second or asymptotic giant branch, modern stellar physics has modelled the internal processes that produce the different phases of the post-main-sequence life of moderate-mass stars, with ever-increasingly complexity and precision. The results of RGB research are themselves being used as the basis for research in other areas, during hydrogen shell burning, the interior of the star goes through several distinct stages which are reflected in the outward appearance. 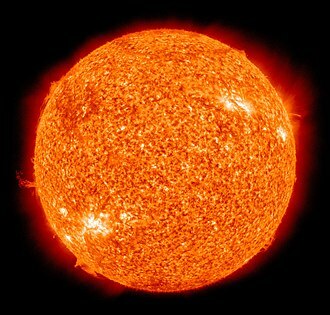 The evolutionary stages vary depending primarily on the mass of the star, after a main-sequence star has exhausted its core hydrogen, it begins to fuse hydrogen in a thick shell around a core consisting largely of helium. The helium core is still below the Schönberg–Chandrasekhar limit and is in equilibrium. Any additional energy production from the fusion is consumed in inflating the envelope. Shell hydrogen fusion continues in stars of solar mass until the helium core increases in mass sufficiently that it becomes degenerate. The core shrinks, heats up, and develops a strong temperature gradient, the hydrogen shell, fusing via the temperature-sensitive CNO cycle, greatly increases its rate of energy production and the stars is considered to be at the foot of the red-giant branch. In astrophysics, accretion is the accumulation of particles into a massive object by gravitationally attracting more matter, typically gaseous matter, in an accretion disk. Most astronomical objects, such as galaxies and planets, are formed by accretion processes, the idea proposed in the 19th century that Earth and the other terrestrial planets formed from meteoric material was developed in a quantitative way in 1969 by Viktor Safronov. He calculated, in detail, the different stages of planet formation. Since then, the theory has been developed using intensive numerical simulations to study planetesimal accumulation. Stars form by the collapse of interstellar gas. Prior to collapse, this gas is mostly in the form of molecular clouds, as the cloud collapses, losing potential energy, it heats up, gaining kinetic energy, and the conservation of angular momentum ensures that the cloud forms a flatted disk—the accretion disk. A few hundred years after the Big Bang, the Universe cooled to the point where atoms could form. As the Universe continued to expand and cool, the atoms lost enough kinetic energy, as further accretion occurred, galaxies formed. Galaxies grow through mergers and smooth gas accretion, accretion occurs inside galaxies, forming stars. Stars are thought to form inside giant clouds of cold molecular hydrogen—giant molecular clouds of roughly 300,000 M☉ and 65 light-years in diameter, over millions of years, giant molecular clouds are prone to collapse and fragmentation. These fragments form small, dense cores, which in turn collapse into stars, the cores range in mass from a fraction to several times that of the Sun and are called protostellar nebulae. They possess diameters of 2, 000–20,000 astronomical units, compare it with the particle number density of the air at the sea level—2. 8×1019/cm3. 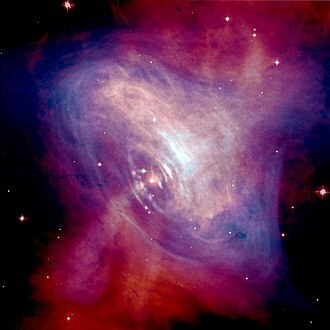 The initial collapse of a solar-mass protostellar nebula takes around 100,000 years, every nebula begins with a certain amount of angular momentum. This core forms the seed of what will become a star, as the collapse continues, conservation of angular momentum dictates that the rotation of the infalling envelope accelerates, which eventually forms a disk. Hydrogen is a chemical element with chemical symbol H and atomic number 1. With a standard weight of circa 1.008, hydrogen is the lightest element on the periodic table. Its monatomic form is the most abundant chemical substance in the Universe, non-remnant stars are mainly composed of hydrogen in the plasma state. The most common isotope of hydrogen, termed protium, has one proton, the universal emergence of atomic hydrogen first occurred during the recombination epoch. At standard temperature and pressure, hydrogen is a colorless, tasteless, non-toxic, since hydrogen readily forms covalent compounds with most nonmetallic elements, most of the hydrogen on Earth exists in molecular forms such as water or organic compounds. Hydrogen plays an important role in acid–base reactions because most acid-base reactions involve the exchange of protons between soluble molecules. In ionic compounds, hydrogen can take the form of a charge when it is known as a hydride. The hydrogen cation is written as though composed of a bare proton, Hydrogen gas was first artificially produced in the early 16th century by the reaction of acids on metals. Industrial production is mainly from steam reforming natural gas, and less often from more energy-intensive methods such as the electrolysis of water. Most hydrogen is used near the site of its production, the two largest uses being fossil fuel processing and ammonia production, mostly for the fertilizer market, Hydrogen is a concern in metallurgy as it can embrittle many metals, complicating the design of pipelines and storage tanks. Hydrogen gas is flammable and will burn in air at a very wide range of concentrations between 4% and 75% by volume. The enthalpy of combustion is −286 kJ/mol,2 H2 + O2 →2 H2O +572 kJ Hydrogen gas forms explosive mixtures with air in concentrations from 4–74%, the explosive reactions may be triggered by spark, heat, or sunlight. The hydrogen autoignition temperature, the temperature of spontaneous ignition in air, is 500 °C, the detection of a burning hydrogen leak may require a flame detector, such leaks can be very dangerous. Hydrogen flames in other conditions are blue, resembling blue natural gas flames, the destruction of the Hindenburg airship was a notorious example of hydrogen combustion and the cause is still debated. 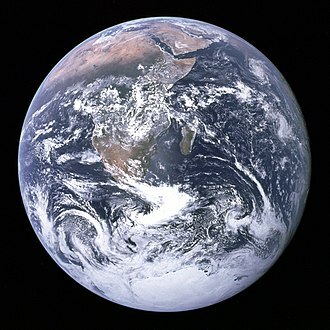 Earth, otherwise known as the World, or the Globe, is the third planet from the Sun and the only object in the Universe known to harbor life. It is the densest planet in the Solar System and the largest of the four terrestrial planets, according to radiometric dating and other sources of evidence, Earth formed about 4.54 billion years ago. Earths gravity interacts with objects in space, especially the Sun. During one orbit around the Sun, Earth rotates about its axis over 365 times, Earths axis of rotation is tilted, producing seasonal variations on the planets surface. The gravitational interaction between the Earth and Moon causes ocean tides, stabilizes the Earths orientation on its axis, Earths lithosphere is divided into several rigid tectonic plates that migrate across the surface over periods of many millions of years. 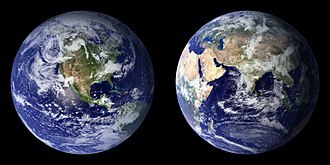 About 71% of Earths surface is covered with water, mostly by its oceans, the remaining 29% is land consisting of continents and islands that together have many lakes and other sources of water that contribute to the hydrosphere. 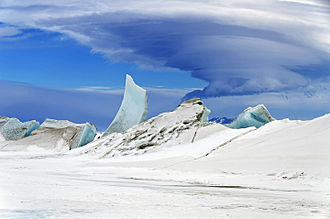 The majority of Earths polar regions are covered in ice, including the Antarctic ice sheet, Earths interior remains active with a solid iron inner core, a liquid outer core that generates the Earths magnetic field, and a convecting mantle that drives plate tectonics. Within the first billion years of Earths history, life appeared in the oceans and began to affect the Earths atmosphere and surface, some geological evidence indicates that life may have arisen as much as 4.1 billion years ago. Since then, the combination of Earths distance from the Sun, physical properties, in the history of the Earth, biodiversity has gone through long periods of expansion, occasionally punctuated by mass extinction events. Over 99% of all species that lived on Earth are extinct. Estimates of the number of species on Earth today vary widely, over 7.4 billion humans live on Earth and depend on its biosphere and minerals for their survival. Humans have developed diverse societies and cultures, the world has about 200 sovereign states, the modern English word Earth developed from a wide variety of Middle English forms, which derived from an Old English noun most often spelled eorðe. The horizontal branch is a stage of stellar evolution that immediately follows the red giant branch in stars whose masses are similar to the Suns. Horizontal-branch stars are powered by fusion in the core and by hydrogen fusion in a shell surrounding the core. The horizontal branch is so named because in low-metallicity star collections like globular clusters, in due course, the helium-enriched core becomes unable to sustain nuclear fusion of hydrogen and that fusion process migrates outward to a shell. The core becomes a region of degenerate matter that does not contribute to the generation of energy and it continues to grow and increase in temperature as the hydrogen fusion in the shell contributes more helium. Stars initially between about 2.3 M☉ and 8 M☉ have larger helium cores that do not become degenerate, instead their cores reach the Schoenberg-Chandrasekhar mass at which they are no longer in hydrostatic or thermal equilibrium. They contract and heat up, which triggers helium fusion before the core becomes degenerate, if the star has more than about 0.5 solar masses, the core eventually reaches the temperature necessary for the fusion of helium into carbon through the triple-alpha process. The initiation of helium fusion begins across the region, which will cause an immediate temperature rise. Within a few seconds the core becomes non-degenerate and quickly expands, non-degenerate cores initiate fusion more smoothly, without a flash. The output of this event is absorbed by the layers of plasma above, the star now changes to a new equilibrium state, and its evolutionary path switches from the red giant branch onto the horizontal branch of the Hertzsprung–Russell diagram. This term means that the luminosity of the star will stay relatively stable while the temperature increases. More massive stars spend a time on the horizontal branch. The shape of the branch is due both to the movement of individual stars bluewards as they age, and to the temperature of stars with different masses when they reach the horizontal branch. There are further variations, both in luminosity and temperature, due to metallicity and helium content, the horizontal branch ends in a blue tail with hotter stars having lower luminosity, occasionally with a blue hook of extremely hot stars. In astronomy, the term compact star is used to refer collectively to white dwarfs, neutron stars, and black holes. It would grow to include exotic stars if such hypothetical dense bodies are confirmed, most compact stars are the endpoints of stellar evolution and are thus often referred to as stellar remnants, the form of the remnant depending primarily on the mass of the star when it formed. These objects are all small in volume for their mass, giving them a high density. A compact star that is not a hole may be called a degenerate star. The usual endpoint of stellar evolution is the formation of a compact star, most stars will eventually come to a point in their evolution, when the outward radiation pressure from the nuclear fusions in its interior can no longer resist the ever-present gravitational forces. When this happens, the star collapses under its own weight, for most stars, this will result in the formation of a very dense and compact stellar remnant, known as a compact star. Compact stars have no internal energy production, but will—with the exception of black holes—usually radiate for millions of years with excess heat left from the collapse itself. According to the most recent understanding, compact stars could form during the phase separations of the early Universe following the Big Bang. Primordial origins of known objects have not been determined with certainty. Although compact stars may radiate, and thus cool off and lose energy, they do not depend on high temperatures to maintain their structure, barring external disturbances and proton decay, they can persist virtually forever. Black holes are generally believed to finally evaporate from Hawking radiation after trillions of years. The somewhat wider definition of compact objects often includes smaller solid objects such as planets, the stars called white or degenerate dwarfs are made up mainly of degenerate matter, typically carbon and oxygen nuclei in a sea of degenerate electrons. 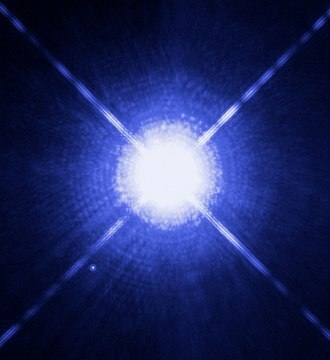 White dwarfs arise from the cores of stars and are therefore very hot when they are formed. As they cool they will redden and dim until they become dark black dwarfs. White dwarfs were observed in the 19th century, but the high densities and pressures they contain were not explained until the 1920s. A star is a luminous sphere of plasma held together by its own gravity. The nearest star to Earth is the Sun, many other stars are visible to the naked eye from Earth during the night, appearing as a multitude of fixed luminous points in the sky due to their immense distance from Earth. Historically, the most prominent stars were grouped into constellations and asterisms, astronomers have assembled star catalogues that identify the known stars and provide standardized stellar designations. However, most of the stars in the Universe, including all stars outside our galaxy, most are invisible from Earth even through the most powerful telescopes. Almost all naturally occurring elements heavier than helium are created by stellar nucleosynthesis during the stars lifetime, near the end of its life, a star can contain degenerate matter. Astronomers can determine the mass, age and many properties of a star by observing its motion through space, its luminosity. The total mass of a star is the factor that determines its evolution. Other characteristics of a star, including diameter and temperature, change over its life, while the environment affects its rotation. A plot of the temperature of stars against their luminosities produces a plot known as a Hertzsprung–Russell diagram. Plotting a particular star on that allows the age and evolutionary state of that star to be determined. A stars life begins with the collapse of a gaseous nebula of material composed primarily of hydrogen, along with helium. 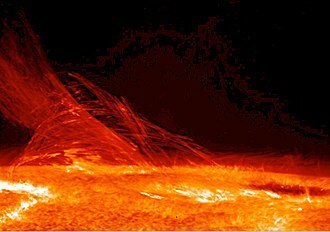 When the stellar core is sufficiently dense, hydrogen becomes steadily converted into helium through nuclear fusion, the remainder of the stars interior carries energy away from the core through a combination of radiative and convective heat transfer processes. The stars internal pressure prevents it from collapsing further under its own gravity, a star with mass greater than 0.4 times the Suns will expand to become a red giant when the hydrogen fuel in its core is exhausted. In some cases, it will fuse heavier elements at the core or in shells around the core, as the star expands it throws a part of its mass, enriched with those heavier elements, into the interstellar environment, to be recycled as new stars. A planetary nebula, often abbreviated as PN or plural PNe, is a kind of emission nebula consisting of an expanding, glowing shell of ionized gas ejected from old red giant stars late in their lives. Herschels name for these objects was popularly adopted and has not been changed and they are a relatively short-lived phenomenon, lasting a few tens of thousands of years, compared to a typical stellar lifetime of several billion years. After most of the red giants atmosphere is dissipated, the radiation of the hot luminous core, called a planetary nebula nucleus. 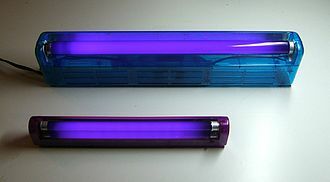 Absorbed ultraviolet light energises the shell of gas around the central star. Planetary nebulae likely play a role in the chemical evolution of the Milky Way by expelling elements to the interstellar medium from stars where those elements were created. Planetary nebulae are observed in distant galaxies, yielding useful information about their chemical abundances. Starting from the 1990s, Hubble Space Telescope images have revealed many planetary nebulae to have extremely complex, about one-fifth are roughly spherical, but the majority are not spherically symmetric. The mechanisms that produce such a variety of shapes and features are not yet well understood. The first planetary nebula discovered was the Dumbbell Nebula in the constellation of Vulpecula and it was observed by Charles Messier in 1764 and listed as M27 in his catalogue of nebulous objects. To early observers with telescopes, M27 and subsequently discovered planetary nebulae resembled the giant planets like Uranus. William Herschel, discoverer of Uranus, eventually coined the term planetary nebula, the nature of planetary nebulae was unknown until the first spectroscopic observations were made in the mid-19th century. 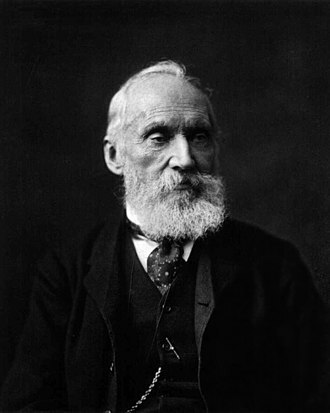 Using a prism to disperse their light, William Huggins was one of the earliest astronomers to study the spectra of astronomical objects. 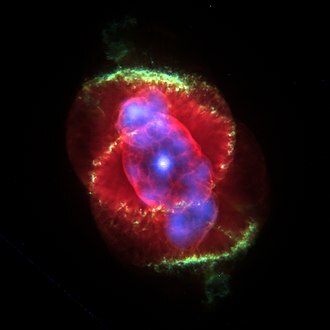 On August 29,1864, Huggins was the first to analyze the spectrum of a planetary nebula when he observed Cats Eye Nebula and his observations of stars showed that their spectra consisted of a continuum of radiation with many dark lines superimposed. A PPN emits strongly in infrared radiation, and is a kind of reflection nebula. It is the second-from-the-last high-luminosity evolution phase in the cycle of intermediate-mass stars. The name protoplanetary nebula is an unfortunate choice due to the possibility of confusion with the term being sometimes employed when discussing the unrelated concept of protoplanetary disks. To avoid any confusion, Sahai, Sánchez Contreras & Morris 2005 suggests employing a new term preplanetary nebula which does not overlap with any other disciplines of astronomy. They are often referred to as stars, although that category includes stars that will never ionize their ejected matter. When the hydrogen envelope has been reduced to around 10−3 M☉. At this point, the temperature of the star, T*, will be around 5,000 K and it is defined to be the end of the LAGB. During the ensuing protoplanetary nebula phase, the stars effective temperature will continue rising as a result of the envelopes mass loss as a consequence of the hydrogen shells burning. During this phase, the star is still too cool to ionize the slow-moving circumstellar shell ejected during the preceding AGB phase. However, the star appear to drive high-velocity, collimated winds which shape and shock this shell. Observations and high-resolution imaging studies from 1998 to 2001, demonstrate that the rapidly evolving PPN phase ultimately shapes the morphology of the subsequent PN, at a point during or soon after the AGB envelope detachment, the envelope shape changes from roughly spherically symmetric to axially symmetric. The resultant morphologies are bipolar, knotty jets and Herbig–Haro-like bow shocks and these shapes appear even in relatively young PPN. The PPN phase continues until the star reaches around 30,000 K and it is hot enough to ionize the circumstellar nebula. In such a model, the accretion disk forms through binary interactions, magneto-centrifugal launching from the disk surface is a way to convert gravitational energy into the kinetic energy of a fast wind. In astronomy, the main sequence is a continuous and distinctive band of stars that appears on plots of stellar color versus brightness. These color-magnitude plots are known as Hertzsprung–Russell diagrams after their co-developers, Ejnar Hertzsprung, Stars on this band are known as main-sequence stars or dwarf stars. These are the most numerous true stars in the universe, after a star has formed, it generates thermal energy in the dense core region through nuclear fusion of hydrogen atoms into helium. During this stage of the lifetime, it is located along the main sequence at a position determined primarily by its mass. All main-sequence stars are in equilibrium, where outward thermal pressure from the hot core is balanced by the inward pressure of gravitational collapse from the overlying layers. The strong dependence of the rate of generation in the core on the temperature and pressure helps to sustain this balance. Energy generated at the core makes its way to the surface and is radiated away at the photosphere, the energy is carried by either radiation or convection, with the latter occurring in regions with steeper temperature gradients, higher opacity or both. The main sequence is divided into upper and lower parts. Stars below about 1.5 times the mass of the Sun primarily fuse hydrogen atoms together in a series of stages to form helium, a sequence called the proton–proton chain. Above this mass, in the main sequence, the nuclear fusion process mainly uses atoms of carbon. Below this mass, stars have cores that are entirely radiative with convective zones near the surface, with decreasing stellar mass, the proportion of the star forming a convective envelope steadily increases, whereas main-sequence stars below 0.4 M☉ undergo convection throughout their mass. When core convection does not occur, a helium-rich core develops surrounded by an layer of hydrogen. In general, the more massive a star is, the shorter its lifespan on the main sequence, after the hydrogen fuel at the core has been consumed, the star evolves away from the main sequence on the HR diagram. The behavior of a star now depends on its mass, with stars below 0.23 M☉ becoming white dwarfs directly, more massive stars can explode as a supernova, or collapse directly into a black hole. Deoxyribonucleic acid is a molecule that carries the genetic instructions used in the growth, development and reproduction of all known living organisms and many viruses. 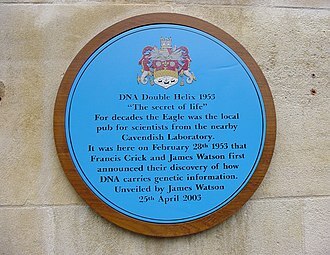 DNA and RNA are nucleic acids, alongside proteins and complex carbohydrates, most DNA molecules consist of two biopolymer strands coiled around each other to form a double helix. The two DNA strands are termed polynucleotides since they are composed of simpler units called nucleotides. Each nucleotide is composed of one of four nitrogen-containing nucleobases—cytosine, adenine, or thymine —a sugar called deoxyribose, and a phosphate group. The nucleotides are joined to one another in a chain by covalent bonds between the sugar of one nucleotide and the phosphate of the next, resulting in an alternating sugar-phosphate backbone. The nitrogenous bases of the two polynucleotide strands are bound together, according to base pairing rules, with hydrogen bonds to make double-stranded DNA. The total amount of related DNA base pairs on Earth is estimated at 5.0 x 1037, in comparison the total mass of the biosphere has been estimated to be as much as 4 trillion tons of carbon. The DNA backbone is resistant to cleavage, and both strands of the double-stranded structure store the same biological information and this information is replicated as and when the two strands separate. A large part of DNA is non-coding, meaning that these sections do not serve as patterns for protein sequences, the two strands of DNA run in opposite directions to each other and are thus antiparallel. Attached to each sugar is one of four types of nucleobases and it is the sequence of these four nucleobases along the backbone that encodes biological information. RNA strands are created using DNA strands as a template in a process called transcription, under the genetic code, these RNA strands are translated to specify the sequence of amino acids within proteins in a process called translation. Within eukaryotic cells DNA is organized into structures called chromosomes. During cell division these chromosomes are duplicated in the process of DNA replication, eukaryotic organisms store most of their DNA inside the cell nucleus and some of their DNA in organelles, such as mitochondria or chloroplasts. The Space Shuttle Main Engine burnt hydrogen with oxygen, producing a nearly invisible flame at full thrust. 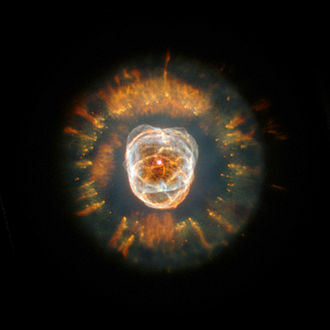 The Eskimo Nebula is illuminated by the white dwarf at its center. 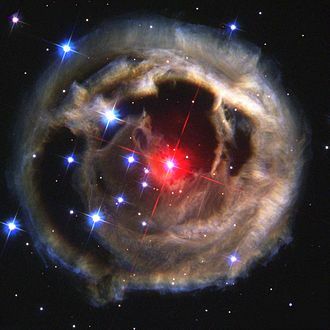 Formerly a white dwarf, V838 Monocerotis has accreted enough material to become a red supergiant. 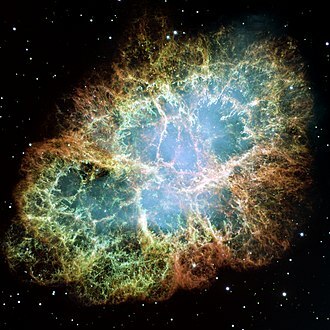 The Crab Nebula is a supernova remnant containing the Crab Pulsar, a neutron star. A simulated black hole of ten solar masses, at a distance of 600km. A diagram depicting the habitable zone boundaries around stars, and how the boundaries are affected by star type. This new plot includes Solar System planets (Venus, Earth, and Mars) as well as especially significant exoplanets such as TRAPPIST-1d, Kepler-186f, and our nearest neighbor Proxima Centauri b. 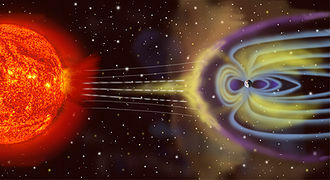 Natural shielding against space weather, such as the magnetosphere depicted in this artistic rendition, may be required for planets to sustain surface water for prolonged periods. 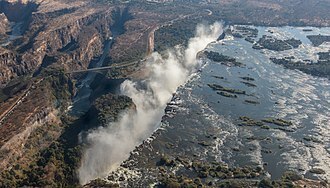 Earth's hydrosphere. Water covers 71% of Earth's surface, with the global ocean accounting for 97.3% of the water distribution on Earth. The habitable zone of Gliese 581 compared with our Solar System's habitable zone. Assembly of galaxy in early Universe. ALMA observations of the Orion Nebula complex provide insights into explosions at star birth. Dwarf galaxy ESO 553-46 has one of the highest rates of star formation of the 1000 or so galaxies nearest to the Milky Way. Within a few million years the light from bright stars will have boiled away this molecular cloud of gas and dust. The cloud has broken off from the Carina Nebula. Newly formed stars are visible nearby, their images reddened by blue light being preferentially scattered by the pervasive dust. 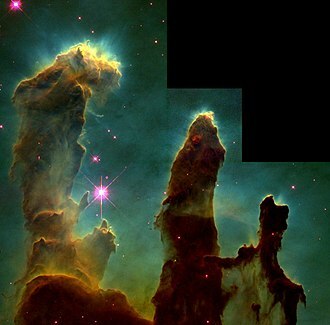 This image spans about two light-years and was taken by the Hubble Space Telescope in 1999. Molecular cloud Barnard 68, about 500 ly distant and 0.5 ly in diameter. Circinus molecular cloud has a mass around 250,000 times that of the Sun. Distribution of molecular gas in 30 merging galaxies. Infant star CARMA-7 and its jets are located approximately 1400 light-years from Earth within the Serpens South star cluster. HBC 1 is a young pre-main-sequence star. 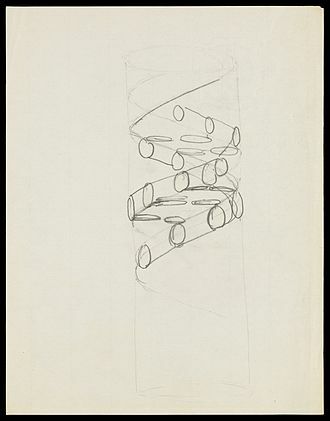 The structure of the DNA double helix. The atoms in the structure are colour-coded by element and the detailed structures of two base pairs are shown in the bottom right. Artist's conception of the spiral structure of the Milky Way showing Baade's general population categories. The blue regions in the spiral arms comprise the younger Population I stars, while the yellow stars in the central bulge are the older Population II stars. In reality, many Population I stars are also found mixed in with the newer Population II stars. A Hubble Space Telescope image of NGC 6397, with a number of bright blue stragglers present. 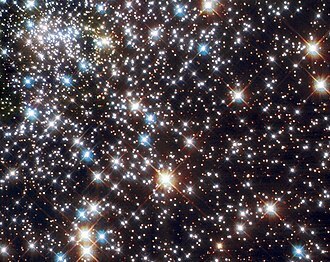 The globular cluster NGC 6388, observed by the Hubble Space Telescope. Hot and brilliant O-type main-sequence stars in star-forming regions. These are all regions of star formation that contain many hot young stars including several bright stars of spectral type O. A Hertzsprung–Russell diagram plots the actual brightness (or absolute magnitude) of a star against its color index (represented as B−V). The main sequence is visible as a prominent diagonal band that runs from the upper left to the lower right. This plot shows 22,000 stars from the Hipparcos Catalogue together with 1,000 low-luminosity stars (red and white dwarfs) from the Gliese Catalogue of Nearby Stars. Protoplanetary nebula known as IRAS 20068+4051 taken by Hubble's Advanced Camera for Surveys. Hertzsprung–Russell diagram for globular cluster M5. The red-giant branch runs from the thin horizontal subgiant branch to the top right, with a number of the more luminous RGB stars marked in red. Artist's conception of the planets of Upsilon Andromedae.